It’s also apparently the sixth of seven penitential psalms: not that it matters greatly, as the idea of ascent captures my imagination more powerfully. Out of the depths I cry to you O God. Hear my voice, incline your ear to my supplications. Out of the depths surely adds a new dimension to ‘ascent’. 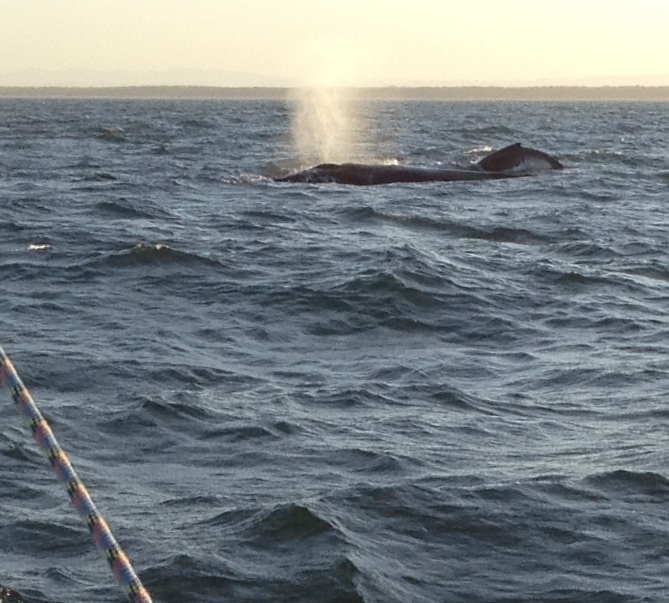 And with whaling in the news this week, I could not resist this pic of whales seen playing off Bribie Island last year. The poem recognises that despite our efforts and capacity for good, we will never reach divine standards in behaviour or nature. The psalmist just waits upon God ‘more than those who watch for the morning’, trusting the divine power will bless with hope (v. 5), love (v. 7) and redemption for Israel (read ‘God’s people’; vv. 7, 8). Turn up this text next time you have an attack of the blues. In our hymn book, TiS No 81 for Psalm 130 begins the verses the same way, but chooses the theme of mercy and redemption for the antiphon. It’s quite a nice setting and should not be overlooked. Last time we sang this song however, following a recommendation by Isaac Everett in The Emergent Psalter, we used a version by Sinead O’Connor. We’ll do the same on 6 April. I do not include a link to the various versions of this song by Sinead, since we use words more closely following the psalm text and will sing it with slightly different style and arrangement. Singers who wish to take part are asked to contact the Cantor soon. We have some backing singers and a bodhrán player but will welcome more voices, particularly women. It’s a gentle and easy arrangement.